Is it possible to disable the category left right arrow and have it same as energot? Thank you for your message. In the next VIVAshop theme version we will implement a new theme option so you may change the way subcategories are displayed. For the moment please open a ticket on our support center here and we’ll be happy to assist. Does anyone have experience with vivashop on nginx server with php 7.2 ?? Do I need a 30 day support to file a bug report? If Allow shopping for unlogged customers: is set to " Hide price and add to cart"
Theme bug reports may always be sent free of charge regardless of your support subscription. We’re always happy when somebody finds a bug in our product, as this will only help us make our product better. Not only that submitting a theme bug report is free, but once a theme bug is detected we immediately proceed with fixing it, upload the fix on your server (or provide you with the necessary modified files), as well as update the theme archive in the Downloads area of your account. Theme bugs are fixed as soon as they are found simply because we do not want other existing or future customers to get the product containing bugs. Therefore, if a theme bug is found we strongly encourage you to immediately let us know about it so that we may go ahead and fix it asap. 1. Extract the new theme archive "viva_v2.26.zip"
2. Navigate to the folder "2.installtion_files/themes"
Alternatively you may open a support ticket and we'll upload the fix for you. This is not a theme bug. This functionality is based on the default CS-Cart code used on the list view of the category pages. So we have just added this functionality on the product pages as well. The entire product short description is displayed with HTML tags. If the short description is missing, then the product long description is striped of HTML tags, then truncated to a smaller size. If the tags are not stripped, then there is a high probability of leaving unclosed tags during the truncate process which will affect the rest of the page. If the long description was not truncated then the full text of the description would be displayed and this could be very long for some products. 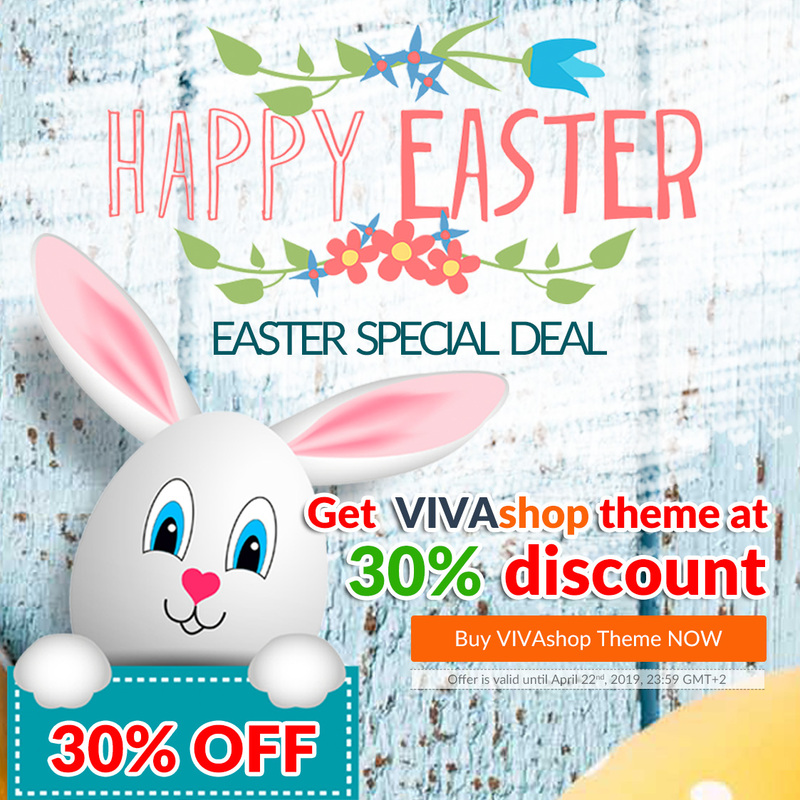 Easter Bunny is here and it brings you a 30% discount on the VIVAshop theme license price! Get the best and most popular CS-Cart/Multi-Vendor theme on the market at a special Easter price! Click here to grab the discount now!